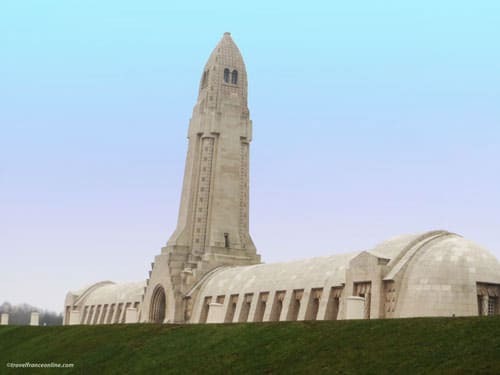 Douaumont Ossuary and Necropolis are located on the site of the Battle of Verdun, in the commune of Fleury-devant-Douaumont. They were created at the initiative of the Monsignor Ginisty. The bishop of Verdun wanted to give a decent burial to the soldiers who fell during the battle. The Battle de Verdun indeed ended with the death of 300, 000 French and German soldiers. Tragically, the bodies of 160,000 men, among whom 60,000 French, were never found. 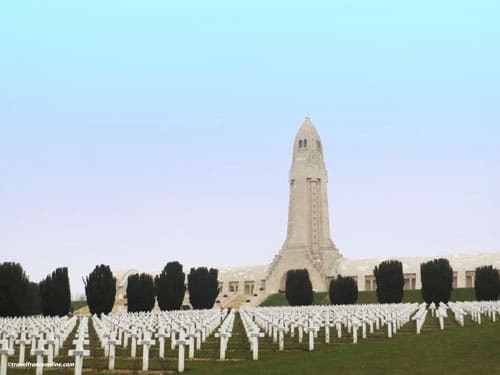 Douaumont Ossuary includes the national military necropolis, which contains the graves of 16,142 known French soldiers, and the ossuary. The Ossuary is a gallery-shaped building surmounted by a Lantern of the Dead tower. It shelters the bones of 130,000 unknown French and German soldiers. The remains of the 160,000 soldiers who were never found, still rest in the earth of the former battlefield that spreads all around the Douaumont Ossuary. This extensive burial ground is a protected zone. It has been kept in its original war state, however, was returned to nature. Thick bushes and small trees grow among the ancient trenches and shell craters and soften their contour. However, some sections of the battlefield, villages and farm land, were returned to cultivation or construction. Thus, 3 or 4 soldiers' bones are discovered each year, often after severe weather, as they come back up to the surface of the earth! One of these extraordinary discovery took place on May 28, 2013. 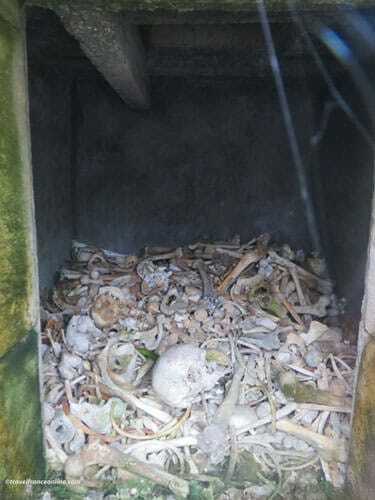 Germans tourists indeed discovered a bone, while visiting the ruined site of the village of Fleury-devant-Douaumont. Excavations uncovered 26 French soldiers’ skeletons! We know that these soldiers died of their wounds. Their bodies were placed in the cellar of a village house that had been turned into Advanced Dressing Station. Sadly, only 7 of these soldiers wore a military plate and could therefore be identified. Only three of their descendants were traced. Two chose to repatriate their grandfathers' bodies to their town of origin. The 3rd person, however, decided that her grandfather should rest along with his comrades in Douaumont Cemetery. A moving ceremony took place on December 5, 2013 in order to pay tribute to these French Soldiers, who were re-buried in the cemetery with full military honours. The previous discovery of this amplitude took place on May 2, 1991. The bones of the French writer Alain Fournier and 20 of his comrades were indeed unearthed in St-Remy-la-Calonne. The Douaumont cemetery was open on a section of the battlefield. It was inaugurated on September 29, 1929 in the presence of President Doumergue. A multitude of white crosses covers the side and top of the Douaumont hill. They surround the imposing Ossuary and its Lantern of the Dead. The cemetery spreads over a 144 380m2 area. 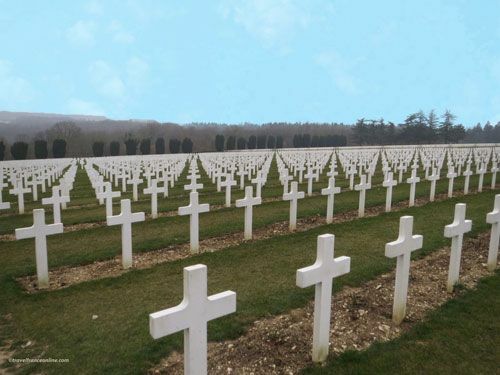 It contains the graves of 16,142 identified French soldiers who fell at the Battle of Verdun. This figure includes 592 Muslim soldiers of the French Colonial Forces, whose remains were placed to rest in the Muslim section. Their graves are facing Mecca. In 2006, President Chirac inaugurated the memorial mosque erected on the eastern edge of the necropolis. 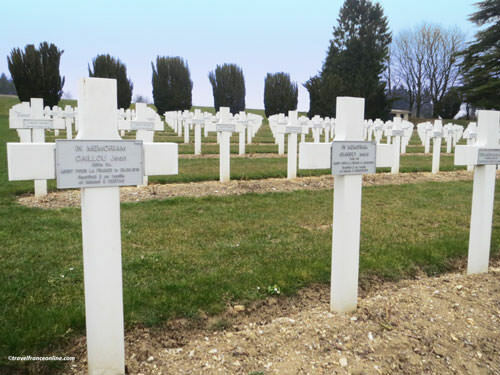 The bones of the soldiers, found in Fleury-devant-Douaumont in 2013, were buried in the next section. A memorial wall, honouring the memory of Jewish soldiers, was unveiled in the western section of the cemetery in 1938. Marshal Petain decided that the place of honour should be given to General Anselin. General François Anselin indeed volunteered to lead the assault on the Fort of Douaumont and fell on October 24, 1916. His grave was therefore placed at the bottom of the grand staircase, on the south facing slope of the Douaumont hill. 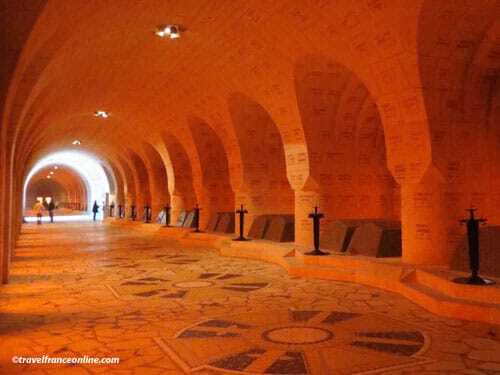 The Douaumont Ossuary is a 137m long gallery-shaped building with a central Lantern of the Dead. Impressive, yet sober, it was designed by the architects Leon Azema, Jacques Max Edrei and Jacques Hardy. Some think it resembles a shell, others a gigantic sword sank in the ground to the hilt. The Lantern of the Dead is 46m high - one meter per sector of the Battle of Verdun. The top-platform, which boasts spectacular views over the surrounding countryside and battlefield, is a lighthouse. At night, its light beam can be seen for kilometers around and sweeps the battlefield, where thousands of soldiers still lay buried. An orientation table allows the visitor to imagine the layout of the battlefield. The massive bell, known as Bourdon de la Victoire, rings for official ceremonies. Access to the Ossuary is done via the Lantern of the Dead, at the rear of the building. The museum is located on the 1st floor. It exhibits detailed models of the battlefield and countless items from the Battle of Verdun. The exhibits includeamong others a Minenwerfer, a German mortar of 76mm, in perfect state of conservation and classified as a Historical Monument. Don't miss the film about the Battle of Verdun, shown in the ground floor room by the ticket office. It will help you understand the dynamics of this deadly offensive. 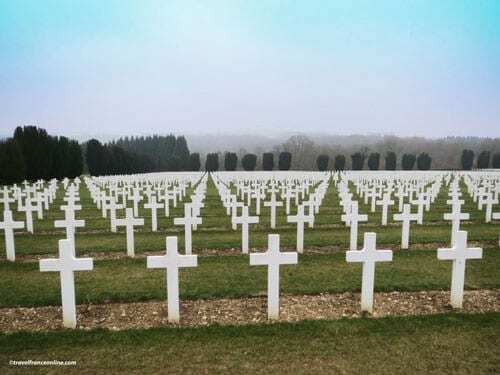 The Douaumont Ossuary contains the bones of 130, 000 unknown soldiers, French and Germans, who died in 1916. The 137m long Ossuary is designed like a cloister; it is open with alcoves and ends with two apses. It stretches on both sides of the Chapel that is located just underneath the Lantern of the Dead. Marshal Petain laid the first stone on August 22, 1920. The remains of the men fallen in the different sectors of the battlefield were officially transferred in Douaumont. 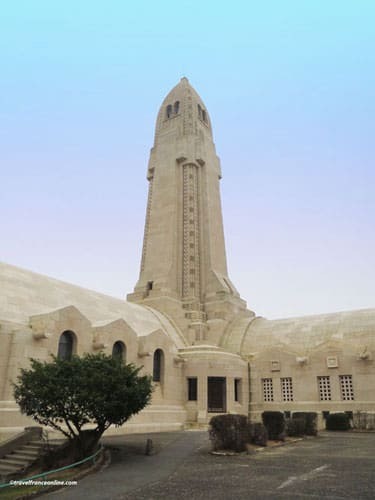 The Ossuary was inaugurated on September 18, 1927. A ceremony of reconciliation, led by the French president Francois Mitterrand and German Chancellor Helmut Kohl, took place on September 22, 1984. In 2008, President Sarkozy presided the first ceremony of the Armistice of November 11, 1918 that ever took place in Douaumont. One of the most meaningful symbols of this reconciliation took place on February 9, 2014. 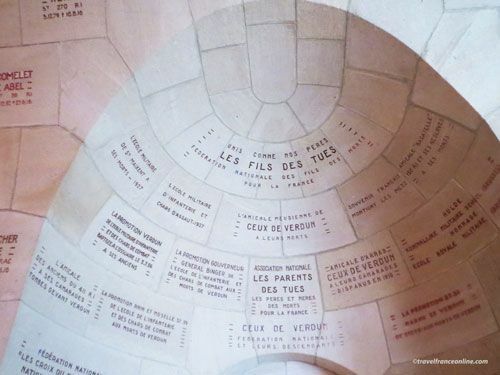 On that occasion, the name of Peter Freundl, a German soldier who died on May 28, 1916, was engraved in the stones of the Ossuary's vaulted ceiling, along with those of French soldiers. Douaumont Ossuary underwent complete renovation for the celebration of the Battle of Verdun Centennial on September 22, 2016. The north wall of the Ossuary or cloister is open with 18 alcoves - similar to lateral chapels - each containing two tombs. Each end of the cloister ends with an elongated apse; each apse contains five tombs. 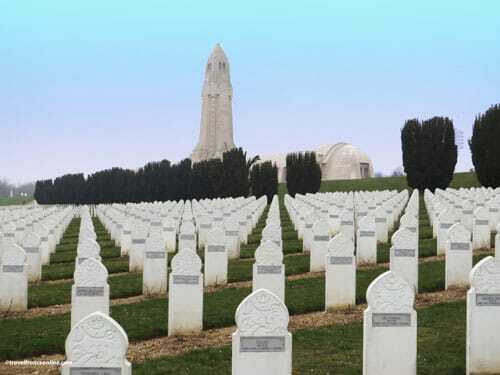 The 46 tombs corresponds to the 46 main sectors of the Battle of Verdun. 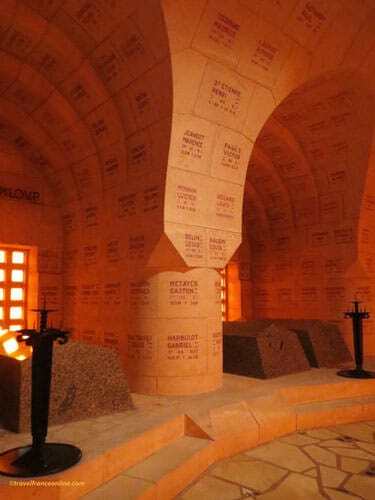 Each tomb stands above a 14m3 vault, that contains the bones of the unknown soldiers who died in each sector. The walls of the alcoves are engraved with their names. Each stone of the cloister's vaulted ceiling is inscribed with the name of unknown soldiers and veteran associations. It also bears dedications to the soldiers who died during WWI, War of Indochina and War of Algeria. All this is obviously quite sad and moving! The cloister, however, is bathed in a soft amber light that filters through the tall stained-glass windows of the south facing wall. The light produces a soothing atmosphere conducive to meditation. Once outside, walk towards the Ossuary's north facing wall. It has narrow windows, which look straight into the vaults. This is exceedingly moving as you can see thousands of piled bones! These are the bones of the soldiers whose identity was never discovered. 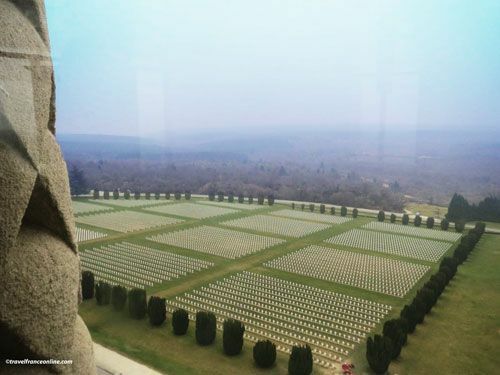 Francois Hollande and Angela Merkel traveled to the Douaumont Ossuary in order to commemorate the Centenary of the Battle of Verdun. This commemoration was the first since the death of the last Poilu, Lazare Ponticelli on March 12, 2008. It could have been celebrated with dignity and reverence, but it was simply pathetic! The German filmmaker Volker Schlöndorff especially produced a show that brought together 3,400 young Germans and French. They rushed out of the woods, ran among the tombs then fought a mock battle in front of the Ossuary before collapsing on the ground, accompanied by the sound of the music band Tambours du Bronx. This show aroused many indignant reactions among the public and the political groups. Many people considered it indecent and unworthy and a complete lack of respect for the Dead and their Memory.